Good Versus Evil: Youth Wind Ensemble Explores Opposing Forces in “The Music Of Darkness and Light"
Pacific Symphony Youth Wind Ensemble (PSYWE) continues its milestone 10th anniversary season with a deeply probing performance, “The Music of Darkness and Light.” Join the highly talented young musicians of PSYWE, led by Gregory X. Whitmore, as they seek to explore music’s connection to the most basic of human experiences—good and evil. The concert opens with two works that celebrate life: Ron Nelson’s rousing “Rocky Point Holiday” and Roy Magnuson’s “House Plants in Terracotta Pots,” with its minimalistic beckoning of curiosity, followed by Brian Balmages’ introspective “Kindred Spirits.” Then, bask in Aaron Perrine's “Only Light” before experiencing the power of David Maslanka’s, “Liberation,” featuring a full chorus performing alongside one of the nation’s greatest youth wind ensembles. 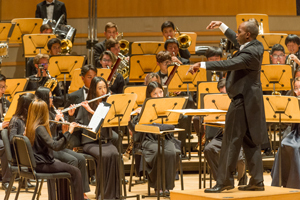 PSYWE performs its spring concert on Sunday, March 26, at 1 p.m., in the Renée and Henry Segerstrom Concert Hall. Thanks to the generosity of sponsor Larry Woody, this concert is free to attend, but tickets are required. To reserve a general admission seat, call the Symphony’s box office at (714) 755-5799 or CLICK HERE. “The 10th anniversary season for the PSYWE is about artistry, celebration and exploration,” says Maestro Whitmore. “This concert, exploring ‘The Music of Darkness and Light,’ fits well into that programmatic goal of exploring all that music for winds can offer for both ensemble and audience. The reasoning behind the theme of ‘good and evil’ is that all of us can relate to the contrast and conflict between these two forces. Music in so many ways plays a role in both areas (sometimes in the same piece), so the opportunity to program a concert to express this conflict felt right. Each piece comes from one of the particular areas of ‘good’ or ‘evil,’ and also reflects that ethos. 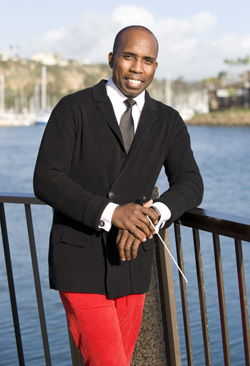 This weightier-than-usual concert seeks to explore the dichotomy of life’s opposing forces through music, opening on the lighter side with Nelson’s imaginative and celebratory “Rocky Point Holiday,” whose joyous and transparent scoring for winds is followed by Magnuson’s “House Plants in Terracotta Pots,” a minimalistic work that is both optimistic and yearning in both color and character. But the concert turns dark rather quickly through the performance of Balmages’ “Kindred Spirits”—a work commissioned after the tragic murder of a family in Maryland. Next is Perrine’s “Only Light,” which is a work that is “all that the title entails—only hopeful, resolute light,” according to Whitmore. “This particular work shows how music can take us from someplace dark and ultimately end in a place of hope.” This piece by a relatively new composer to the wind world will be guest conducted by Armand Hall, associate director of bands at the University of Memphis and conductor of the Memphis Youth Wind Ensemble. 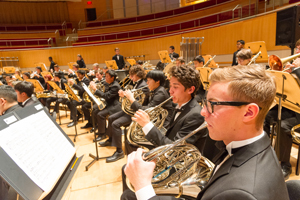 The final piece on the program, Maslanka’s “Liberation,” a 17-minute tone poem for winds and large chorus, highlights the conflict between light and dark. The piece touches upon the realization that we are capable of producing our own judgment day, fire and wrath, and is a powerful evocation of hope. For this work, 110 singers from the Irvine High School Choral Program will join PSYWE to deliver a highly impactful experience. “Liberation,” as it explores the end of life and the hereafter, perhaps “best encapsulates the programmatic theme of this concert,” says Whitmore.